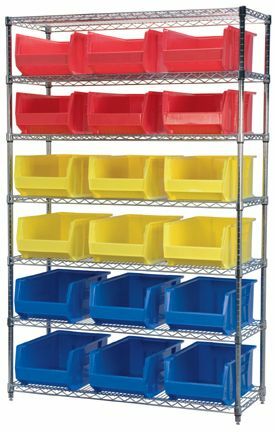 A wide variety of shelf configurations are possible with three sizes of shelving available. Durable AkroBinsÂ®<?xml:namespace prefix = o ns = "urn:schemas-microsoft-com:office:office" />feature a curved bottom hopper front, to enable easy access of small parts. Bins available in Blue (B), Red (R), Yellow (Y), Stone (S), Green (GRN) -- please specify. FOB Shipping Point. D x L x H No. of Shelves No. of Bins Bin No. Wt. (lbs) Price Ea. HAWS1848SAB** 20 x 12-1/4 x 6"
20 x 12-1/4 x 8"
20 x 12-1/4 x 12"
* Available in Blue (B), Red (R), Yellow (Y), Stone (S) only. **Available in Blue (B), Red (R), Yellow (Y) only.